New Clank! In! Space! Launch Kit from Renegade Game Studios! 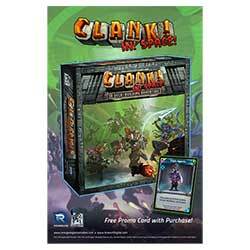 Increase your Clank! In! Space sales with these retailer specific promo cards! Use the poster to advertise the special in your store. Limited to 1 kit per store location. Contents cannot be sold online. In order to receive this kit, use the following link to request a kit. Make sure to list Grosnor as your Distributor.